The Klikor storytellers are experienced weavers. Sadly their skills are rarely called for these days as the weaving process has been mechanised. In order to support their families and their community, they need alternative ways of earning a living. 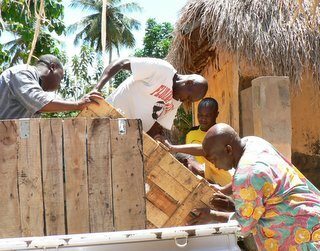 The corn mill (seen here being unloaded) will enable them to mill corn for themselves and local people. It is hoped that the funds will become available to purchase a cassava grater which, together with the corn mill will be housed in a purpose-built shed on land provided by the JohnAnna Foundation. 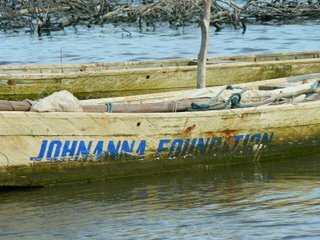 The ten JohnAnna Foundation fishing boats and 50 nets are now in use on the lagoon in Anyako. Until having their own boats, the fishermen storytellers had to rent or borrow someone else’s boat but they now have their own which they also lease out to others in the neighbourhood. Mr. Nutsugah was also a fisherman in his younger days. However, he is now in his 80’s and unable to support himself. Having provided many stories, Mr. Nutsugah is a key contributor to ‘Once Upon a Time in Ghana’. 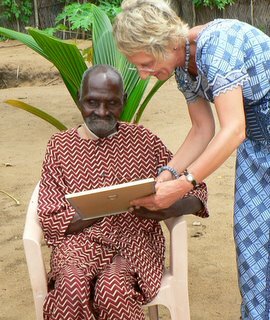 He is therefore being supported with medical insurance, funds for medication, new clothing and funds for his daily needs. Here he is seen looking at a large photo of himself – perhaps the first time he has seen himself in many years! It is thanks to the generosity of the Women’s International Club of Brussels (WIC) and the Plancenoit Choir (La Canterelle) in Belgium, that the storytellers in Have Domefe have been able to buy a plot of virgin land which they are busy cultivating. It will support a variety of crops including Moringa, highly valued as all its parts can be used by people and animals. The stories will now be used in the classroom so that the pupils are re-acquainted with their cultural heritage which has been neglected in the recent past. 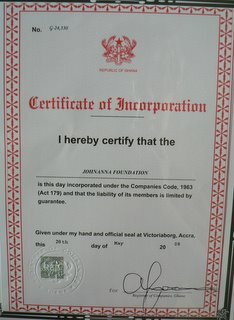 Having official Non-Governmental Organisation (NGO) status lends weight to the JohnAnna Foundation. It also acts as an umbrella for all the activities arising from the storytelling project.